Nothing goes to waste in my home. I'm always thinking of ways to use my leftovers. I had some leftover mashed potatoes from dinner the other night. I think for most people potato is a favorite. I love potatoes. They are affordable. Low calories, full of nutrition and can be prepared in variety of ways. Have you ever wonder why your potatoes turn green? They turn green because exposure to light... not good eats. Potatoes should be kept in a dark cool well ventilated place. Potatoes and onions are great friends in any dish, but they should never be stored together. They both will spoil faster. Heat oil and butter in skillet over medium high heat. Form large patties. In a dish add flour, salt and pepper, mix. 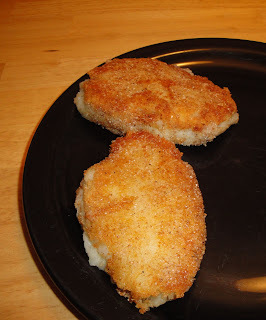 Coat potato patties in flour. Add the potato patties to skillet and reduce heat to medium low heat. Cook until patties are brown. About 10 to 15 minutes, turn and cook on the other side until brown. Sprinkle with salt and serve. Enjoy! Note: Don't turn the potato cakes to soon, you won't get the buttery crust. Hi Diane, thanks for stopping by. Hi Tammy, thanks for stopping by. That just looks so good. Thanks for the tips on storing food. Hi Christine-I did let you know that I have an award for you, but unfortunately, Blogger did not put the list of the names back I had on there. I'm not making a new list again, it took a long time to link it, so I'm just letting you know, that I awarded you the Sisterhood of the World Bloggers award. Please stop by to take it! Your potato cakes look so comforting and delcious with the crunchy coating, I would love one right now since I have a piece of pork chop for me to prepare for one! Great way to use leftover potatoes - Thanks! Yes, please, I'll have a few!! YUM! Wow good use of left over Christine and yummy at that too! Shame on me for not yet having a potato cake. Thanks for the recipe. Hi Elisabeth, I am very excited and honored to be awarded! Thanks so much. What a great idea! I love potato cakes, but I usually buy ready made ones. Thank you for sharing the recipe :). I have seen these over at FoodFrenzy and they immediately caught my attention: they look soooo yummy! I'd love to try and make them! I'm sure my family would love them. yummy! i love potato cakes and these look so good! crunchy and perfectly golden... awesome job! makes me want to have one right now :) Thanks for sharing! My Mom makes similar mashed potato cakes, and I'd forgotten about them. It's a delicious use of leftover mashed potatoes. Thanks for the reminder! My guys would be delighted with this recipe...now we just need them not to finish up the mashed potatoes :) Thanks, Christine! The crust is the best part - definitely don't want to miss that! Potatoes are the one thing in my house that everyone loves any way you fix them. These look so good and I am hungry this morning, too! Thanks for coming by my place. I enjoyed checking out your blog. Have a great week. My husband loves mashed potatoes, I am sure he would adore these! These are great. I've had similar before that also had parmesan cheese in...it was delish. Hi Jen, cheese, chopped bacon, chives sound great with the potatoes, and little kielbasa. Yum! Hi Southernlady64, thanks for stopping by. Have a good week. I love mashed potatoes, add on a buttery crust and you just made them even better!!! Great idea! I didn't know that onions and potato cannot store together...hhmmm now I know, thanks for the tip. thanks for stopping by my blog and leaving a comment! i just got very hungry stopping by yours!! !